Presentation at The Circle of HOPE conference next week! If you live near or are planning travel to New York City next week, I would encourage you to check out the HOPE (Hackers On Planet Earth) conference at the Hotel Pennsylvania (July 20-22, 2018). The location couldn’t be more accessible: across the street from Penn Station and down the block from the Empire State Building. The HOPE conference is diverse with an incredibly wide range of topics spanning technology, culture and so more. We’re talking about “hacking” in the best sense: those with the technical knowledge and ingenuity to overcome problems and better understand/explore the world around us. HOPE always has a strong contingent of radio enthusiasts as well–many of whom also attend the Winter SWL Fest in Plymouth Meeting, PA. This will be my first HOPE conference so I’m especially honored to have been selected as a presenter. Since the earliest days of radio transmitting, individuals and organizations have made an effort to record and preserve radio signals in the form of broadcasts and other over-the-air communications, especially those of historical significance. Now low-cost software-defined radios (SDRs) coupled with today’s faster memory-enhanced computers allow us to record not just individual signals from one radio station at a time, but an entire broadcast band – a wide swath of frequencies – all at once. Each recording from a particular day and time can easily contain dozens, if not hundreds, of stations broadcasting and communicating simultaneously. Later, via a software-defined radio application, recordings can be tuned and listened to (decoded) as if they were live. This talk will discuss how you can build your own “radio time machine” which supports such virtual time shifts by utilizing an inexpensive ($25-$100) SDR, and also show how you can – for free – virtually “travel” through recent history on radio archivists’ preexisting radio time machines. My two main goals with this presentation are to bring more radio converts into our hobby by showing how accessible and dynamic radios are today and also to give The Radio Spectrum Archive some exposure. This mini-lamp developed for use in impoverished regions where there’s no electrical grid is powered by a surprising, but ubiquitous, waste product – the residual energy in depleted (used) AA batteries. Workshop attendees will build a HumanaLight on a high-quality printed circuit board. The kit includes all necessary parts, even a “dead” AA battery! No experience required. There is a $15 fee for the kit, with the proceeds going to the nonprofit organization Ears To Our World, which developed this valuable and important technology. No kit building experience is necessary! We’ll help and guide you as you build an incredibly useful tool! If you’re an amateur “ham” radio operator, you’re part of a hacker community that goes back over a century. Bring your handie-talkie to QSO with the many hams at HOPE to keep up with what’s happening. Visit Special Event Station W2H and operate on several HF/VHF/UHF bands in various voice and data modes to freely communicate with hams around the globe – sans telecom infrastructure! Our 70cm repeater input is 442.875 MHz (PL 167.9) and the output is 447.875 MHz which W2H operators will be monitoring. We also encourage simplex ops on 147.545 MHz and 433.545 MHz (PL 77.0). If you can’t tell, it looks like an action-packed weekend! I’m super excited and (admittedly) a little intimidated! Should be lots of fun. Full details can be found at The Circle of HOPE conference website. This entry was posted in Current Events, News and tagged Dave Cripe (NM0S), Ears To Our World, ETOW, ETOW HumanaLight, Hackers On Planet Earth, Ham Radio, HOPE, HOPE 2018, NM0S, Radio Spectrum Archive, SDR, Software Defined Radio, The Circle of HOPE on July 10, 2018 by Thomas. I would like to give a hearty shout-out to the good folks at HamNation, via Leo Laporte’s TWiT network, for so prominently featuring Ears To Our World–and ETOW’s new HumanaLight kit!–in the latest episode. This year at the Dayton Hamvention, I was pleased to meet George Thomas (W5JDX), who produces the excellent “Solder Smoke” series of instructional videos which teach novices how to build kits and other electronic projects. I’ve always found these videos clear, highly comprehensible, and easy to follow. George kindly agreed to make an instructional video for us, clearly illustrating how to build the HumanaLight. George is also a co-host of HamNation, but I never thought he would include the HumanaLight in an episode. I was surprised to find that he made the HumanaLight kit a “Solder Smoke” segment, then went on to prominently promote ETOW...truly an honor. His video, moreover, does an excellent job showing viewers how to build the HumanaLight (and mentions that you can purchase one at Universal Radio). For the interesting history behind the HumanaLight, read this post or check out HumanaLight.org. This entry was posted in News, Slightly Off Topic and tagged Ears To Our World, ETOW, ETOW HumanaLight, George Thomas W5JDX, HumanaLight, Leo Laport, Solder Smoke, TWiT on August 3, 2014 by Thomas. If you’ve been an SWLing Post reader for long, you probably know that I’m the founder and director of Ears To Our World (ETOW), a charity built on the belief that access to information is access to education. And that access is achieved, of course, via radio: self-powered radios distributed to schools and communities in remote, impoverished regions throughout the world. ETOW is my passion; we see tangible results come from this practical, simple mission. At ETOW, we receive feedback from the teachers, children, and communities where we regularly work; through them, we’ve learned how important the little LED lamp on our self-powered radios is, especially in communities that live largely or entirely off-grid. At the same time, because there is often a glut of used-up batteries (and other trash) in the communities we serve, I wanted to find a way to recycle this waste product. I realized this might be a good opportunity for an innovative LED flashlight that would offer longevity, shining longer than flashlights that can be purchased locally. Inspired by the Joule Thief, a simple flashlight circuit that cleverly allows light to be produced from a depleted or “dead” AA battery, I wondered if the design could be made even more efficient, and even easier to build…perhaps easy enough for a school-age child to build? I contacted ETOW volunteer engineer, Gregory Majewski, who immediately set to work on the HumanaLight project. His goal: to make a bright, highly-efficient LED flashlight that could be easily built from common, inexpensive electrical parts, and powered by either new (or used) batteries. And what did this talented engineer deliver? The HumanaLight. Greg’s HumanaLight design was astonishing: it produced light–continuously, meaning, without being turned off at all–for two full weeks on a depleted cell. A fresh battery yielded four full weeks of usable light. The original HumanaLight prototype (affectionately known as the “TrashLight”) could be built on most anything, including scraps of wood or plastic. This design, now used in the field, requires no soldering whatsoever and can be built almost entirely from recycled components. Moreover, it can be sold, and the profits reinvested in local schools, health clinics, and other crucial services. In 2011, I presented this light at the IEEE’s inaugural Global Humanitarian Technology conference, where it generated much interest. This year, with the assistance of another volunteer engineer, David Cripe (NM0S), we set about the creation of a simple HumanaLight kit that we can offer for sale here in North America, in order to apply the proceeds to ETOW’s mission. School children, makers, experimenters, and hobbyists of all stripes will all find this a fun kit to assemble–and a useful light in times of emergencies. Ears To Our World, and those we serve, are very much in debt to our volunteer engineers who made this possible. Many, many thanks to Gregorgy Majewski for developing and designing the original HumanaLight circuit; he put many hours into testing this amazingly efficient circuit and bringing it to fruition. 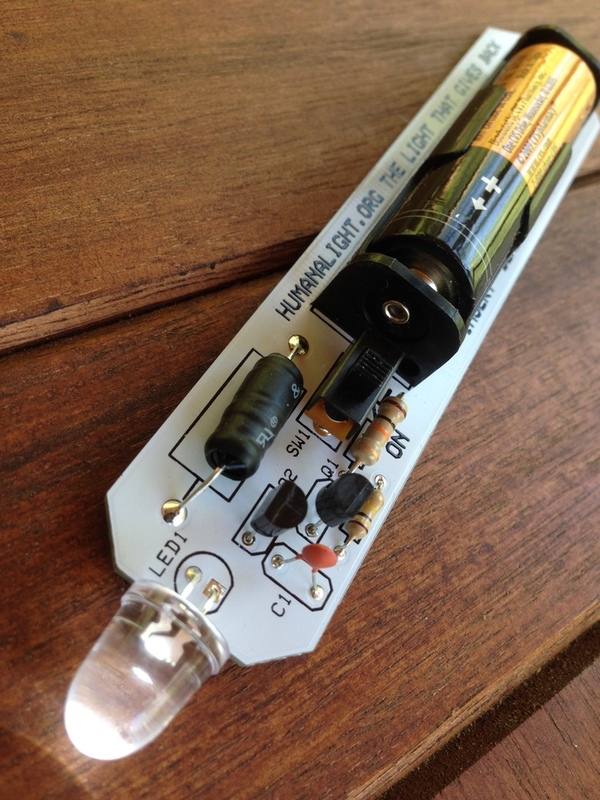 We also heartily thank David Cripe (NM0S) for designing the HumanaLight circuit board and kit. And David’s design makes this kit affordable and functional, too, in support of the light’s original purpose. If you would like to purchase a HumanaLight kit–and support Ears To Our World–please purchase at Universal Radio. Thanks! This entry was posted in News, Slightly Off Topic and tagged Ears To Our World, ETOW, ETOW HumanaLight, HumanaLight, Joule Thief on August 3, 2014 by Thomas. JRH on Possible Tecsun PL-880 hidden feature: Noise reduction adjustment?